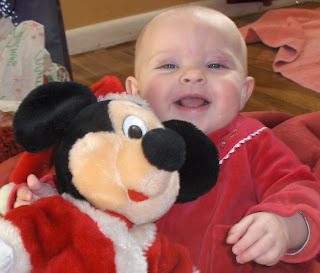 KT's Family Stories: Happy New Year! 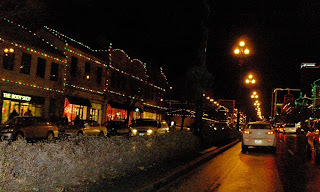 On this first day of the new year, I am posting our photos of... Christmas! It is a New Years gift to myself, because if I get this done, I will be all caught up with the blog. But don't expect another update so soon. With the marathon of 4 posts in a week and a half, I am blogged out. 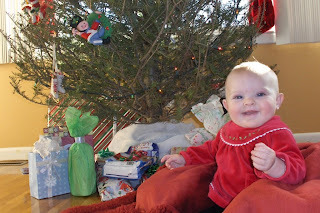 This year we spent our first Christmas at home, which was appropriate since this was Avery's first Christmas. We have started some traditions of our own and look forward to 'tweaking' them as Avery gets older. 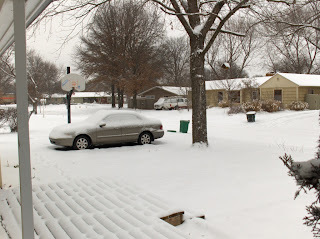 A couple days before Christmas we got a pretty good snow storm. About 3 inches. It was fun to have a 'White Christmas', but what was even more fun for this Arizona girl is that it was about 60 degrees the day after Christmas! 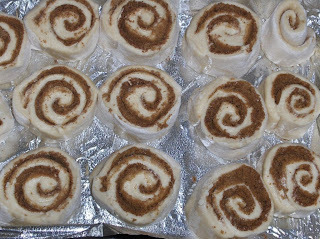 The morning of Christmas we made a batch of homemade cinnamon rolls. This is the before photo, they were gobbled up so quickly after they were out of the oven that I did not get a photo. Suffice it to say, they were very tasty! 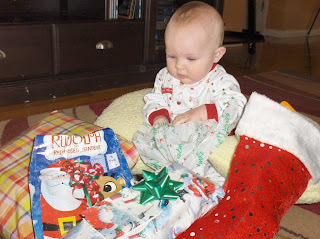 Then it was on to stockings and presents. Avery most liked the paper, but we all had fun. 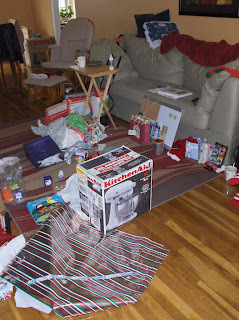 This is the aftermath photo of Christmas morning. I always liked these shots because it is a reminder of all the fun that was had. 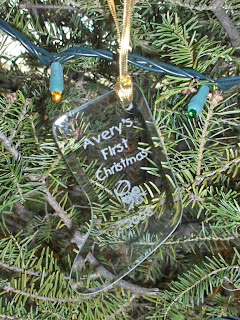 This being Avery's first Christmas, we found a great 1st Christmas ornament for her. It is a bit hard to see here, but it is so sweet. 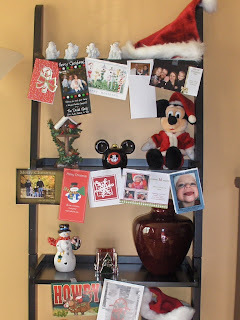 I love Christmas cards! I love sending them, and I love receiving them. Each one that we send and receive is a reminder of the special people in our lives. This year we had a great place to display them, so here is a shot of some of this year's cards. Thank you all who sent them. After opening gifts on Christmas morning, we headed over to Topeka to enjoy the Christmas meal with Kevin's family. We had a really good time around the busy dinner table and I participated in the traditional family Scrabble game. How did I do? Well, someone always has to come in with the lowest score, so this year I humbled myself to take that lowly spot. But as always it was fun. 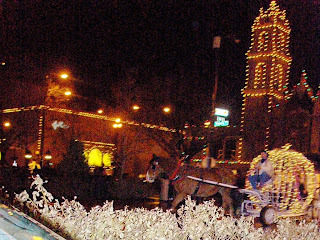 The weekend after Christmas, Kevin, Avery and I went to the Plaza in Kansas City to see the famed Christmas lights. We have tried to do this every Christmas we have been here, but this was our first successful attempt. 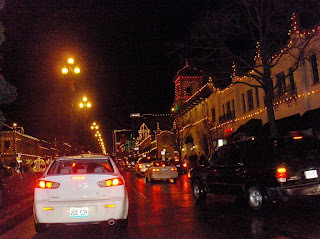 It was fun, but because of the cold and the nearness to Avery's bedtime, we enjoyed the lights from the car. So, that's it! I'm all caught up. 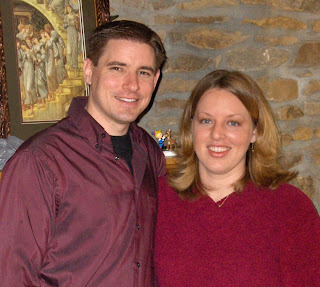 For the New Year celebration we went to some friends house and watched the KU football team win and played the Wii. We were home in time to see the ball drop and Avery slept through the whole experience. I'm sure the significance of a new year will effect her later. We wish you a very happy and blessed New Year! Oh so so precious. What else is there to say. Thanks for updating. "243"